Meeting Place: St. Agnes’ Parish Hall. 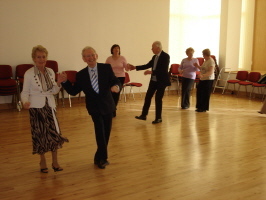 Membership consists of Retired People over 50 years of age. C.A.D.A.R.A. Activities include: Art, Short Mat Bowling, Table Tennis, Sequence Dancing, Walking, Card-playing & Wednesday evening Sing-a-Long. Also, Holidays, Supper Dances, Christmas Parties etc. Application Forms (a number of vacancies exist for anyone wishing to join) available at Parish Centre Reception.